We managed to finish our papal notebook🙂 A major focus, and I learnt a few facts about my children and notebooking along the way. Princess loves notebooking and was quite happy to complete all on offer. Jelly Bean and Jack Jack were keen and interested in the first week and after that…. not happy. Is this age or is it personality? I suspect the later, at least in regards to the girls, JJ is still young so his verdict is not yet in. Trying to discern the implications of my observations for future approaches. We’d read all of the recommended books in the first week, so we read about The Bishop of Rome and a couple of past Popes in Picture Book of Saints. Recently we had read St Pius X: The Farm Boy Who Became Pope, he is one of our favourite saints! :) we also own Pope Pius XII by Louis de Wohl an OOP Vision Book, I offered it to Princess to read independently but she chose not too. 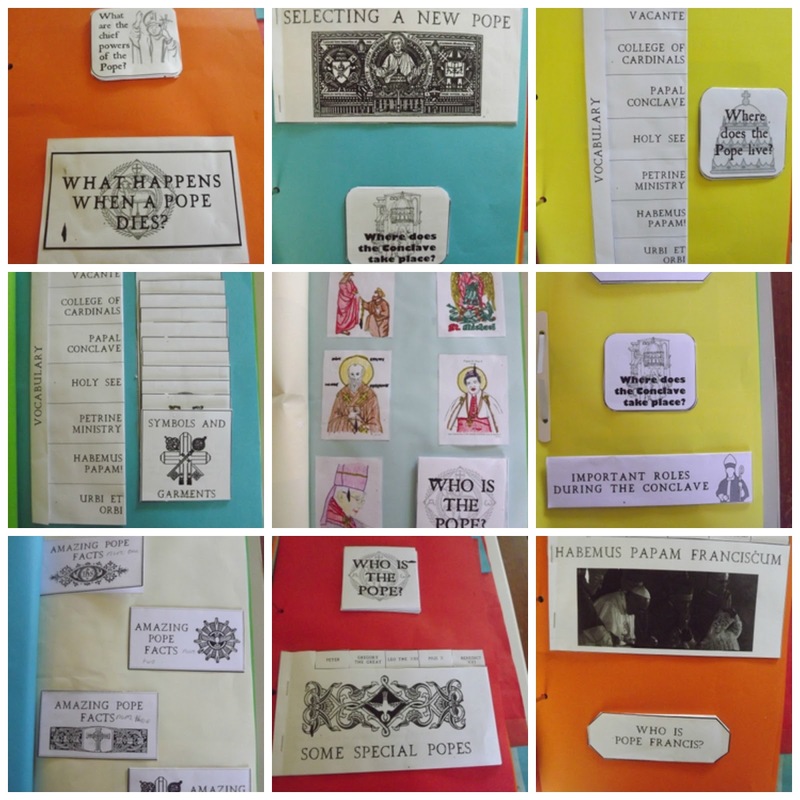 The Fun Facts about Popes in history, caught their interest, we read about The Infallibility of the Church and then they filled in their mini books. Read The Hierarchy and after several discussions they filled in their notebooks. Princess really enjoyed filling in the Amazing Pope Facts, searching through the online links, very interesting! It was at this time that our new Pope was elected! So their minds were moving along. The children were very taken that Snuggles‘ Cardinal became Pope! I had managed to see the Urbi et Orbi live!! I woke the children slightly after and really this was were our heads and hearts were for days after. We filled in the extra notebooks that Jessica incredibly put together! (she mustn’t have slept that night) and then discovered a whole new medium we haven’t used much before, youtubes. How do they choose the Pope was a huge hit, watched several times and then Princess went on to discover related youtubes, she was particularly taken with one discussing name choices. We also read about how the smoke is made black and white. We watched the Urbi et Orbi several times, and this cool compilation, Pope Francis praying at the Basilica of St Mary Major, his first Mass, (did you see those young altar servers, we think they must have been great nephews? anyone? ), and the Dominican Sisters of Mary Mother of the Eucharist when they saw the news, (oh that had me crying again! sweet:) and a few other special moments. It may be an age thing with Jelly Bean and Jack Jack. When we do our project books the older three have a lot more stamina to complete a topic than my youngest. When they were a few years younger I would rarely do a unit study style topic that lasted more than a week. They could maintain the momentum easily for a week, but not much more. I think their little brains get full, which is quite different to the older ones where some information produces more curiosity about a topic. We tried note booking just once. It lasted a day. Never again. The unfinished product sat there haunting me for a whole term. Then I hid it away. Could be right, Princess (11) can handle more for longer. So I shouldn't jump to conclusions regards JB's learning style yet then.